-we are to honor those authorities established by God for all of society as long as they do not conflict with the authority of God’s Word. -we may disobey government (civil obedience - Acts 4) when government establishes law that prohibits what God commands (prayer; worship; Bible possession, reading, and preaching; proclaiming the gospel; prayer; etc.) or commands what God prohibits (all families with two or more children that become pregnant must have an abortion; all disabled or elderly people should be denied life support, etc.). Then we are called Scripturally to obey God and deny man. Other than that, we are to live honorably under the governmental authority that God has established irrespective of what kind of government polity exists in that nation we reside. 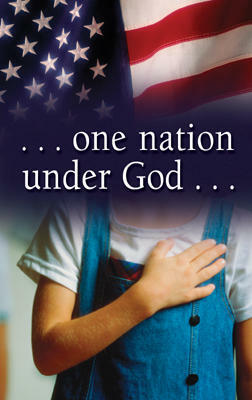 -A federal judge declared Wednesday that the reciting of the Pledge of Allegiance in public schools with the words “under God” is unconstitutional (the Pledge with the words "under God" was inserted by Congress in 1954). -The case was brought by the same atheist whose previous battle against the words "under God" was rejected last year by the Supreme Court on procedural grounds. -Karlton said he was bound by precedent of the 9th U.S. Circuit Court of -Appeals, which in 2002 ruled in favor of Sacramento atheist Michael Newdow that the pledge is unconstitutional when recited in public schools. The Supreme Court dismissed the case last year, saying Newdow lacked standing because he did not have custody of his elementary school daughter he sued on behalf of. -Newdow, an attorney and a medical doctor, filed an identical case on behalf of three unnamed parents and their children. Karlton said those families have the right to sue. Newdow hopes that will make it more likely the merits of his case will be addressed by the high court. "All it has to do is put the pledge as it was before, and say that we are one nation, indivisible, instead of dividing us on religious basis," Newdow told The Associated Press. "Imagine every morning if the teachers had the children stand up, place their hands over their hearts, and say, 'We are one nation that denies God exists,'" Newdow said. David Limbaugh rightly has said, “I -- and all Christians I know -- am opposed to a government-mandated religion. The very concept is repugnant to Christianity, which is all about freedom of conscience. There is no such thing as forced conversion to Christianity, as the choice of Christianity is a matter of individual will (not discounting God's sovereignty in the process, by the way). There has always been the sacred/secular dichotomy in this world. But what is unusual today, is that now religious opinion, conversation and beliefs are divorced from the issues of government, culture and education. The government cannot constitutionally establish any national religion—that is protected by the First Amendment (Congress shall make no law respecting an establishment of religion, or prohibiting the free exercise thereof; or abridging the freedom of speech, or of the press; or the right of the people peaceably to assemble, and to petition the government for a redress of grievances). But that doesn’t mean nor mandate that religious speech should be silenced, stifled or abrogated. As with all speech, religious speech is protected by our constitution. That includes “one nation under God” in the pledge of allegiance. It doesn’t establish a national religion; it doesn’t specify any particular faith or denomination that people must worship according to. It simply makes a simple statement of the sovereignty of God over the affairs of men. Take heart on this y’all, for politically this is a nonissue. It has no possibility of garnering any real political support from the Dem’s/liberals—and my guess is, it won’t even get to the Supreme Court or to the floor of Congress for consideration of repeal. What shall we do in response to this concern? 1. Pray for this judge and the family who has brought the suit (1 Tim. 2:1-4). God does direct the heart of the king (Prov. 21:1); and in this case, the heart of our judges too. 2. The Lord can use this incident to bring the good news of the gospel of sola fide, sola gratia and solus Christus to the family and this judge. Wouldn’t it be tremendous if the Lord granted saving faith to the very ones challenging the mentioning of His name in the public arena? And tha they became witnesses for the Lord and His truth? He can do it... remember the Apostle Paul (Acts 9). 3. Rest in the knowledge that God is sovereign; and the courts are not. 4. All nations are “under God” – whether they recognize it or not. He controls His creatures, government and creation for His glory, pleasure and purposes alone. What a time we live in for the church to be the church. The October 12, 1892 Columbus Day celebration of the 400th Anniversary of the discovery of America was planned for years in advance, and anticipated much as modern Americans look forward to and plan for the advent of a new century. The United States had recovered from most of the effects of its Civil War that began 30 years earlier, and people from around the world were flocking to the "Land of Opportunity". The previous year almost a half million immigrants had entered the United States through the Barge Office in Battery Park, New York and on New Years day of 1892 the new Federal Bureau of Receiving's station at Ellis Island had opened. I pledge allegiance to my Flag, and to the Republic for which it stands: one Nation indivisible, With Liberty and Justice for all. I pledge allegiance to my the Flag of the United States, and to the Republic for which it stands: one Nation indivisible, With Liberty and Justice for all. I pledge allegiance to the Flag of the United States of America, and to the Republic for which it stands: one Nation indivisible, With Liberty and Justice for all. "In this way we are reaffirming the transcendence of religious faith in America's heritage and future; in this way we shall constantly strengthen those spiritual weapons which forever will be our country's most powerful resource in peace and war." I pledge allegiance to the Flag of the United States of America, and to the Republic for which it stands: one Nation under God, indivisible, with Liberty and Justice for all. In 1892, 1923, 1924 and 1954 the American people demonstrated enough concern about the actual words in the Pledge to make some necessary changes. Today there may be a tendency among many Americans to recite "by rote" with little thought for the words themselves. Before continuing with our tour, let's examine these 31 words a little more thoroughly. yet formed into a UNION of one Nation. this government also being represented by the Flag to which I promise loyalty. And these principles afforded to EVERY AMERICAN, regardless of race, religion, color, creed, or any other criteria. Just as the flag represents 50 individual states that cannot be divided or separated, this Nation represents millions of people who cannot be separated or divided. *Promise your loyalty to the Flag itself. *Promise your loyalty to your own and the other 49 States. Recognizing that we are ONE Nation under God, that we cannot or should not be divided or alone, and understanding the right to Liberty and Justice belongs to ALL of us. 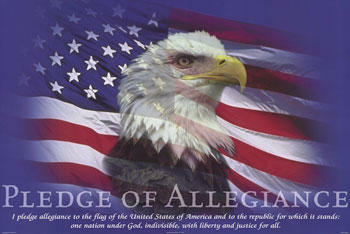 I think that is the first time that I have ever heard and understood what the "Pledge of Allegiance" meant. Thanks for that. So should the pledge contain "under God" in it? Or should it go back to before it had it. I think that it probably should be removed, not because I think that we should not recognize our soveriegn ruler. But our government should recognize and demonstrate unreligious bias. If it said Budah or Muhamad I think that I would want it changed. Red Skelton's interpretation of the Pledge of Allegiance (As a reminder, he relates how he began reciting the pledge as a boy when there were only 48 states, and before "under God" was even added). At the very end of the audio, he refers to the addition of "under God." Sledge, I really like your 4th response: "All nations are 'under God' – whether they recognize it or not. He controls His creatures, government and creation for His glory, pleasure and purposes alone." A simple but profound truth. Very interesting, littlegal, the Red Skelton piece. Thank you very much! You're quite welcome, Campi. A little background on it: The audio is from the January 14, 1969 episode of CBS-TV's "The Red Skelton Hour." Red Skelton's "Pledge" was twice read into the Congressional Record of the United States and received numerous awards. Yes, it is very interesting, especially when you consider the double irony -first, it's ironic when you think how far CBS has drifted in standards from that 1969 evening, and secondly, when you consider that Red was almost prescient in the supposition of his final comment, and, as you stated, it came to temporary fruition in 2002, 5 years after his death. (And now, Newdow's at it again). Rush will most likely be airing this again soon, as he did during the 2002 court battle. Steve - I sure appreciate you posting this today. littlegal - I appreciate your addition as well, I know I've heard that before, but it's been years. What does 'Under God' mean? Steve says, "under the Divine providence of God...according to the words of President Eisenhower". I would 'argue' that it means both less and more... 'Less' in the sense it 'recognizes' that their is something outside 'ourselves' - the divine (whether that is 'cosmic consciousness' or the One True God is immaterial). That is not an 'endoresement' of religion, merely a recognition of the existence of a 'divine'. "I do solemnly swear that I will support and defend the constitution of the United States against all enemies, foreign and domestic; that I will bear true faith and allegiance to the same; and I will obey the orders of the President of the United States and the orders of the Officers appointed over me, according to regulations and uniform code of military justice. So help me God!" There is another saying, "Freedom has a price the protected will never know!" Since I swore to defend this country with the help of God! [And it cost me friends, loved ones, and body parts] I can 'damn' sure pledge allegiance to THAT nation UNDER GOD. I wondered if you read my blog last week Campi. Anyway, While I am all in favor of loyalty to defend the nation, I sure wish many of our Christian brothers and sisters were as fired up about calling the nation and the church to repentance. A true patriot is one like Jeremiah who loved his people enough to point out their sins and call them to return to God. Patriots indeed were everywhere on 9/11 and following, but definitely by another definition than that of our founding father George Washington, for he addressed that anyone who sought to subvert the twin pillars of morality and religion (and he meant Christianity) in government could not rightly call himself a patriot. So, while I don't personally think that a pledge will make us more godly or not, I would much rather Christians pledge their allegiance to Christ and the gospel, than to the flag any day. By the way, thank you veterans for your honorable service. This is not an attack on verterans, merely a conviction of the heart. As a Veteran, I didn't take it as an attack on 'veterans'. My previous comments here, and on my own blogs should tell you I agree 100% - changed lives will do more for this country than all the 'pledges' ever said! You need to take a look at your Church's website man! Wanting to do a wordpress install? Yikes! Anyhow, I learned something new, I didn't know Margaret Becker help write cheap grace. Anyhow, I feature that song on my blog today. It's been 30 years since I last spoke to you in a little church in Reno NV. My wife and I were talking about you today and how you have had such a huge impact on our lives! We are reaching out to you just to encourage you. You have been used by God and we just wanted you to know how much we appreciate you and your music. Love you so much! The Knights of Columbus were instrumental in having the words "under God" added to the pledge. I am proud to be a member of the Knights. By the way, your 107 theses brought me to your site. As a listener of 1980s CCM I must agree. I love traditional hymns now and gave up on CCM years ago (but I am sure there are good people in the industry today). Tim, thank you for your comments. I have always wrestled with pledging my allegiance to the flag simply because there are things done by and in the name of our country that I totally disagree with. 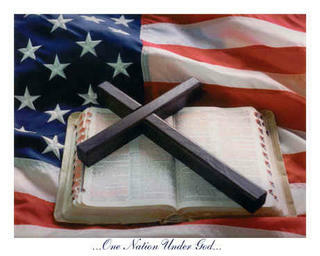 I love my country, and I know that God has truly blessed this nation, so please don't get me wrong. I pray for my country as well as our leaders, but I cannot, in good conscience, pledge allegiance to the flag. I do pledge allegiance to the cross of Jesus Christ, however, and do realize that much too often my government and country's actions reflect what is contrary to the way of the cross. Pray for mercy for our nation and government, that continues to pass laws that are contrary to the God that we say we are under.